I don't consider myself overly political when it comes to social politics - save the whales, save the environment....I find myself in the category of being interested in those articles, wanting to improve (ex. recycle more), but I am far from a 'tree hugger' (which is yet another stereotype of being spiritual/new age/ or a channel). Enter John Oliver. I love this dude. He is political, but he uses humor to get across his messages. As I watch his show (and subscribe to his youtube channel) I have become much more aware of the injustices that he has no fear in shining a light on. You go for it, John Oliver!!! His latest one, on chicken farmers, got me thinking - do people who are trying to be 'a good person' ever wonder what the right thing to do is when you get sent a video like this? We live in Canada, this is a USA show, but much of what he talks about affects us too. So how can one be political and earth conscious without being considered some cuckoo who is constantly griping about conspiracy theories? I decided I would ask SAM what exactly they thought about what we humans should be doing in regards to videos or articles that show up in social media. Do we share them? Ignore them? Get on the bandwagon? What is in balance? The farmers who raise the chickens in the most inhumane environment actually are not making money - they are below the poverty line due to the chicken companies regulating them, and the government not regulating the chicken companies. It's basically, according to SAM, a situation of bullying all around. The chickens are bullied by being put in these huge chicken houses, without sunlight or space to move. They are given antibiotics and growth hormones so when the chicken is ready to land on our dinner plate, it will be twice the size of a free range chicken. Farmers who speak out against the treatment and regulations of the chickens are then bullied by the chicken companies who buy their chickens - they are paid less if they complain, threatened, even shut down. The bigger your mouth and the more you try to stand up for what's right, the more chance you become bankrupt. So the farmers stay quiet, and stay abused by the system. So who can save the day here? This is where the government is supposed to step in to make better regulations to protect the farmers and the chickens from the bullying. But instead, there is bullying within the political system, and so these 'regulations' never get passed. 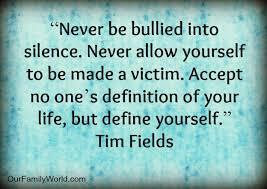 Bullying, bullying, bullying, it's all about power then, and not about what is truly for anyone's highest good. We like the fact that we can take real life events and put our spin or perspective on them to show you a different lens with which to view the world. No, we don't think that the solution is for everyone to get on their soapbox, or chain themselves to the tree that is about to be removed. However, the power paradigm is completely out of balance. As a person who hears about these type of political situations (and there are many, chickens is but a simple example), you believe you have no power - after all, you know you're not going to chain yourself to a chicken house in efforts to save the chickens, nor are you going to 'save the farmers' by speaking out when you hear the farmers are getting threatened. So instead, human instinct is to have a moment of empathy, "Oh, isn't that awful! ", maybe even send around the article or video, and then let it go. And yet...you forget that you, the consumer, have the most power of all, because the chicken companies are in business because of you. Now in John Oliver's stance, he claimed near the end of his video that no one was going to stop eating chicken because everyone loved it. Instead, he wanted the pressure to be put on the new regulations bill that will be passed or not passed in the next month. Yet again, the bullying will interfere with 'doing the right thing' - for those in power will say yay or nay based on whether they have been threatened or feel safe enough to take a stand. So these individuals who hold the power as those who 'represent the people' aren't usually willing to be the sacrificial lamb. So then it has to go farther down the totem pole, and that comes back to you. You the people, decide what happens to both the chickens and the farmers. Do you buy chicken brands that follow this type of practice? Or do you go the extra distance to a different store/shop that sells free range chickens or is supplied by local farmers? Do you educate yourself about these situations so you actually know what you are buying, rather than just shrug as you quickly pick up your chicken at the most convenient supermarket? It is a very powerless feeling to feel like you have no say in these bigger picture issues. And yet, the only reason you don't have say is because you choose to say nothing and do nothing. The power paradigm would switch to the companies having less power, and the government not being coerced into rejecting a bill amendment, if 'the people' were all buying chicken that had humane practices for both the animal in question and the farmers. The paradigm is so unbalanced because you the people, do not feel like there is anything you can do. You, as humans, choose to take the lens of 'Well what can I do about it?". Do you realize you do this in your personal life as well? You notice an injustice - something you have done/has been done to you in the past that you are unwilling to take accountability for. You instead choose to feel like a victim, and then get angrier that no one is saving you or standing up for you. Do you not see the irony, the bigger picture? The consciousness of the planet still needs much work. The most work, in our mind, is in the place of self-accountability. There are many spiritual folks out there focusing on love, joy, peace.....yes yes, even the 'Kumbaya - All Is Well' stereotype. However there is a great need for folks to pay attention to what they do, what they say, and who and what they interact with. You each create your own experience, and in a sense, your own world. Why are you agreeing to play the game in a world where chicken farmers are the prostitutes, the pimps are the companies/lack of government courage, and the chickens themselves are also pawns in this power imbalance? Every time you shrug and say "Oh that's a shame" and move on with your lives, you have just driven by the pimp beating the prostitute on the sidewalk for not providing him with enough quality merchandise - in this case, fat, diseased, hormone/steroid-filled chickens. If you passed someone on the road beating up a farmer, taking away his money, and threatening his life, would you drive by, or help? So why is this any different? It is different because of what we call the 'ignorance is bliss' contract. Many of you humans have chosen to 'stay blind' to much of the power imbalances in the world today. This is the contract that you have made with your interaction on earth during this lifetime - the "It's not my problem...someone else will do something about it." If you see these issues with clarity, then accountability will be required on your parts to DO or SAY something, to make a change, and no one wants to be 'that person'. However, what if everyone was that person? What if after reading this article and watching the John Oliver research on chickens, you actually shared this article and John Oliver's video? What if more people educated themselves to what is really happening, rather than blindly picking products without any understanding of how those products got from production to your table? You need to become accountable as humans, in order to play the game with your eyes open. We're not asking you to hug a chicken, chain yourself to a chicken coop, or stage a revolt in a town meeting. We are asking you to OPEN YOUR EYES, and pay attention to your own individual accountability for who you are, and what/who you choose to interact with on a daily basis. Do you feed into this imbalanced power paradigm, or do you heal it? Something to ponder, isn't it? That's a good point. I asked SAM their answer to THAT one. Here is what they said: We certainly wouldn't be throwing the chicken farmers under the bus in this potential. If the public consumers started showing the government/companies that they wanted chickens that were not farmed through their current method, they would be forced to change their methods. In the meantime, yes, the chicken farmers could be perceived as suffering (less money if less demand), however they are already suffering with less money because the companies can penalize them and no one protects them on what is paid out to them. For the system to improve itself, they too would become squeakier as they lost more income, the public would become even more insistent that these farmers be allowed to create a new paradigm of how the chickens are raised, and because the demand was up for the new paradigm of free-range chickens, the companies, if they wanted to continue to make money, would be forced to follow suit. Right now, nothing is changing because the public is quite happy to accept the unhealthy paradigm for all - for the chickens, the farmers, and those that eat the chickens. The movement in the US is toward eating less meat and free range, local farm meat. We have a ways to go but at least more & more people here are making our voices heard now. I see this as a positive step in the right direction. Maureen have the factory farm animals souls left their body to not have to experience this horrible life? I wish it was the case that the animals don't experience the horrible pain of that kind of life, but the truth of the matter is, they experience it all right down to their own death. HOWEVER, says SAM, if this is to make you feel any better, the contract of all animals who will be slaughtered is of a contract where they are to learn about mistreatment and sacrifice. Think of it as the Souls of these animals are willing to be mistreated and sacrificed for the greater good - to be the stimuli necessary for us humans to watch them get mistreated and see their sacrifice, and change the game plan. Someone has to be the animals that are mistreated in order for us (humans) to get the lesson. This really is no different than human Souls playing out lifetimes where they choose to be in a sacrificial role or even in an 'enemy' role in order to help the rest of the human race get the lesson. Example - a Soul had to be Hitler, Charles Manson, the men who drove the planes into the Twin Towers in New York. The Soul is willing to be 'the one' to create the shift, because the Soul is able to look at the bigger picture and realize the impact they are going to help create for the learning of the world. Someone has to be the bad guy. The ideal situation would be a day when NO SOUL, human or mammal, has to sacrifice or be 'the enemy' in order for us humans to get the lesson. We seem to learn by contrast - we see negative things, experience the negative consequences of those situations, and then say, "Hey, maybe this isn't such a good idea!" and vote for change. Won't it be lovely when each and every person has a high enough consciousness within themselves that they don't need the negative consequences played out in physical reality in order for them to learn and 'get the lesson'? The more you work on connecting in with your Essence and raising your own consciousness, the more chance there is that you won't need to learn by contrast, but instead can learn through positive experience. That's why we're here dear ones....to get people thinking about how they can improve their own inner connection with Source. Then, with each experience and decision they have to make in life, they make the highest consciousness decision that they can make, based on their consciousness level. And then, and only then, will our world start to be a 'better place'. It all starts with you, with 'one'.